Vincent van Gogh voluntarily entered the clinic of Saint-Paul-de-Mausolée in southern France on May 8, 1889. The sanatorium sits just over the mountains from Arles, where Vincent had spent the previous winter producing some of his more energetic and moving canvases. It was also where he had suffered his most severe mental breakdowns, which eventually prompted his hospitalization. From his workroom at the clinic Van Gogh looked down on an enclosed field of wheat. During his eleven-month stay he drew or painted this view some twelve times. 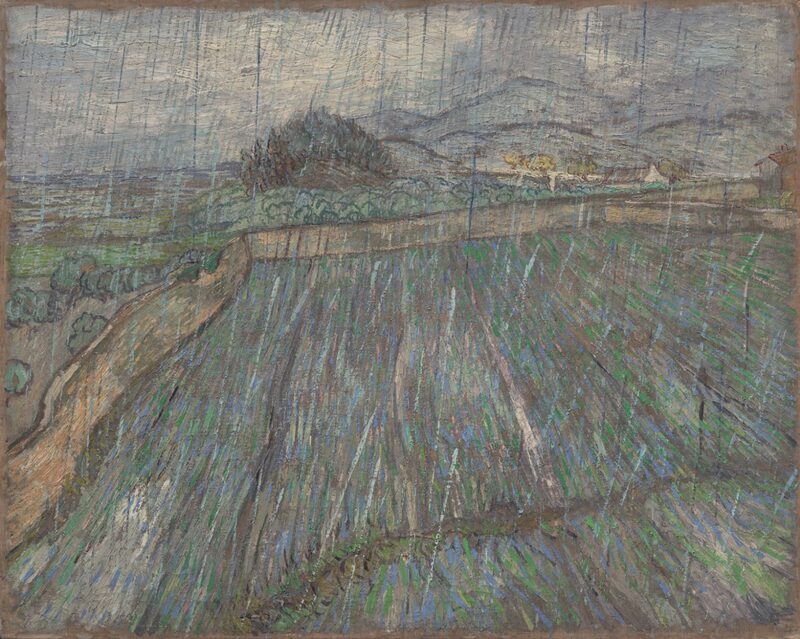 This picture of the wheat field during a rainstorm is the only work of its kind he did in the South, and while the idea of representing rainfall by diagonal slashes of paint clearly relates to Van Gogh's interest in Japanese prints, the final effect is completely personal and well beyond any borrowed source. There is truly nothing quite like it in his considerable output--truly nothing so gently and objectively observed, nothing so completely revealing his own state of mind. Joseph J. Rishel, from Philadelphia Museum of Art: Handbook of the Collections (1995), p. 203. Johanna van Gogh-Bonger, Amsterdam (widow of Theo van Gogh); sold to Hugo von Tschudi (1851-1911), Berlin, April 1903 ; by inheritance to his widow Angela von Tschudi, Munich, who placed it on extended loan to the Neue Pinakothek, Munich; sold to Paul Rosenberg & Co., Paris and New York, 1928, until 1949 ; sold to Henry P. McIlhenny, Philadelphia, May 19, 1949 ; bequest to PMA, 1986. 1. Purchased by Tschudi from the Munich Secession exhibition in 1903 (note in curatorial file). 2. See letter from Walter Feilchenfeldt to Peter C. Sutton dated September 11, 1989 (copy in curatorial file). The painting was exhibited almost every year between 1935-1948, including the traveling Belgrade, Buenos Aires, San Francisco, and Chicago exhibition between 1939-1941. 3. The receipt dated February 24, 1950 from Rosenberg to McIlhenny (copy in curatorial file), notes the first payment on May 19, 1949 and payment in full on February 24, 1950.